Venture capitalists, cleantech executives, and technology experts gathered this week for GreenBeat 2010, hosted by SSE Labs of Stanford University and VentureBeat. John Doerr, Partner KPCB, is optimistic about cleantech. He is one of the most successful venture capitalists of all time, backing Google, Amazon, and my alma mater Sun Microsystems. He has made six new cleantech investments this year. KPCB cleantech investments include Silver Springs Networks, Amyris, Mascoma, Ausra, Bloom Energy, and Fisker Automotive with ambitions to surpass Tesla. Mr. Doerr is enthusiastic about cleantech in California, where voters this Tuesday defeated proposition 23, effectively showing that 60 percent of voters favor California’s climate cap-and-trade program. The oil industry proposition threatened hundreds of cleantech companies and ultimately hundreds of thousands of future jobs. Nationally, however, the voters sent a clear message that they want fiscal responsibility and an economy that creates jobs. Projects that need billions in federal funds or billions in loan guarantees are likely to go nowhere including nuclear, so-called clean coal, and utility-scale solar. Solar experts from SunRun, Sungevity, and SolarBridge observe that business is growing rapidly for distributed solar, confirming our solar energy report that distributed solar will grow over 40 percent annually. 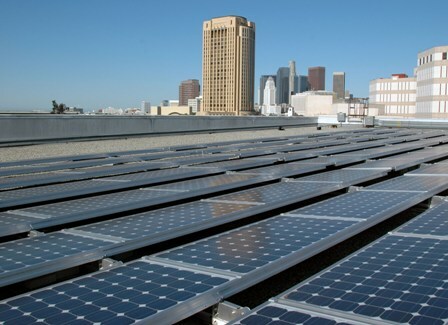 Commercial rooftops can support 100 kW to 20 MW solar projects located where power is consumed. Distribution investment is minimized. In contrast, utility-scale solar in the desert is more expensive to site, according to the industry panel, requires major high-voltage line and distribution investment, and can face years of NIMBY opposition. All this adds cost, risk, and project finance difficulty. These same factors can allow local solar, more expensive per kWh, to compete against remote coal and natural gas. A cap-trade fee for carbon emissions provides added distributed solar advantage over fossil fuel plants. Negawatts are cheaper than megawatts. The biggest opportunities are in helping commercial customers and consumers reduce their electricity and heating bills. The Empire State Building will save over $4 million per year through energy saving initiatives such as installing 6,500 dual pane windows from Serious Materials whose CEO, Kevin Surace, reports that he already has 400 employees and is adding jobs. Optimal energy savings occurs where energy technology converges with information technology to manage everything in buildings and homes from HVAC to lighting. Energy savings of 10 and 20 percent were reported without asking people to change behavior. Customers want these savings without capital expenditure (capex). Innovative companies that provide solutions as services win. Even better is when they implement demand response solutions that make the customer money. Smart grid technology will ultimately be used to manage billions of points of energy generation and consumption. The first payoff of smart grids is allowing electric utilities to be more efficient and avoid payroll costs of manual meter readers and technicians that turn-on home power. So far, the utilities are saving and the ratepayers are footing the bill for smart meters. Consumers are starting to benefit as they get information about where they are losing energy money. Bill Weihl, Green Energy Czar for Google reports a large number of users, with hundreds commenting about saving money. The “killer app” for the smart grid may be electric cars. By charging cars off-peak, utilities will find a home for electricity generated in power plants that like to run 24/7. Consumers, using smart charging and friendly charging apps and net tools, will save with low time-of-use rates for nighttime charging instead of expensive trips to the gas station. Ten cleantech start-ups presented to a panel of venture capitalists at GreenBeat 2010. The winner was Redwood Systems, an intelligent lighting provider. Redwood is already saving money for giant customers like Flour. Redwood provides LED lighting networked with sensors and software for monitoring, control, and automated lighting. The VCs liked that Redwood addressed the need for energy efficiency with a high ROI, low barriers of entry in the built environment, and no big capex decision by the customer.